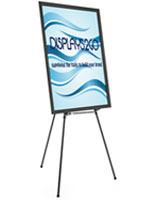 What is the most cost-effective way to showcase portable signage? 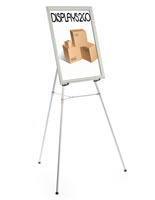 Easels with poster frames provide the best of both worlds. They offer fast setup with total flexibility. 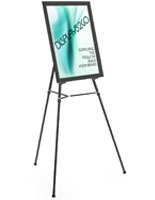 Whether you need to prop up a sign inside a hotel lobby or welcome guests to a work seminar, easels with poster frames are the perfect choice for the job. 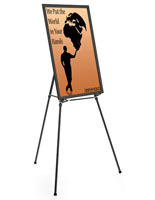 What's more, these floor standing print displays are offered at a low, overall cost. With most models priced under $100, you get the stand and sign holder together in one convenient bundle. Their value will only increase in time because they can be used again and again. 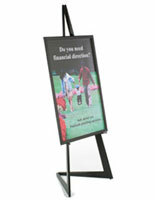 Floor easels with poster frames provide the necessary call to action for any promotion or event! What are the available options regarding these tripod/sign holders? 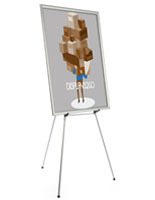 Display easels come in wood or aluminum styles. Choosing one or the other depends on your type of application. For more utilitarian functions, we recommend the aluminum tripods with telescoping legs. They are lightweight and collapse down to a comfortable, portable size. The stands come with black or silver anodized finishes which match well with the corresponding frame color. 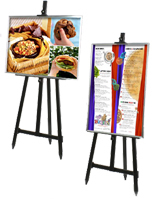 For more upscale events, choose a wood easel. These models bring a little added decoration to the overall presentation. The stands also look much more substantial with a heavier presence than their thin aluminum counterparts. While they don't collapse down to a small size, they do fold flat for efficient storage. 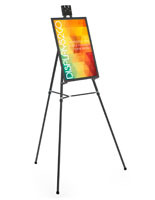 The included poster holders come in two styles: rear-load or front-load. 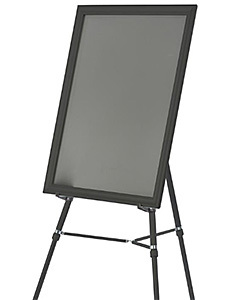 Most of the frames that come with an easel use snap-open technology. 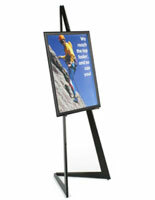 These front-loading picture holders make changing a graphic a quick and easy task. Each frame side flips open for accessing the poster. The whole process takes less than a minute, making them excellent choices for daily restaurant menus or events that change on a timely basis. Rear-load frames are the traditional choice. To insert a sign or graphic, the backer needs to be opened up from behind. While not as fast as the snap frame, these are better suited for displaying the same poster continuously. An annual event that uses the same promotional graphics every year would be such an example. Using tripods for display purposes have many uses. Thanks to their portability and ability to be placed just about anywhere, they have become quite visible in a large number of applications. However, their main function is to attract attention to the occasion at hand. Announce a seasonal sale in front of your store. Display food menus to lure potential patrons through your door. Welcome guests to an outdoor wedding. Promote the new traveling art exhibit at the museum. Point visitors to the seminar at trade shows. Advertise musical acts in pubs and bars. And what about locations such as nightclubs with very low lighting? 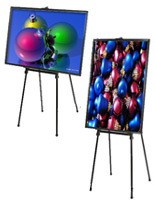 Illuminated LED signs with floor easel combos add to the festive atmosphere. Your handwritten messages jump to life with colorful glowing lights behind the write-on surface. A fabulous way to promote any live musical event!